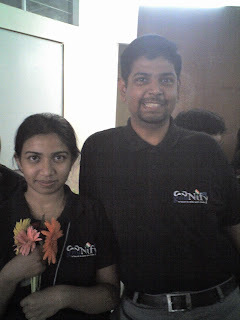 GNUnify is a very sweet event that takes place at Symbiosis Institute of Computer studies and Research(SICSR), the very same place BARCAMP, Pune was held. 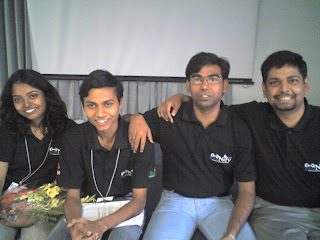 I was glad to be a part of it on its 5th year on 27th and 28th January 2007. It gave me double pleasure! On the first day I was a volunteer while on the second day I was a speaker. The event that attracted many students and IT professionals from Pune was very well organized and had a lot of good sessions. 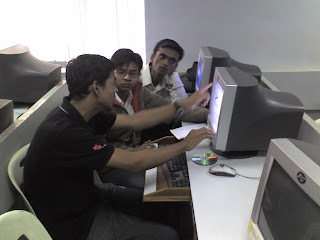 I myself conducted many installation sessions of Linux for novices on day one . 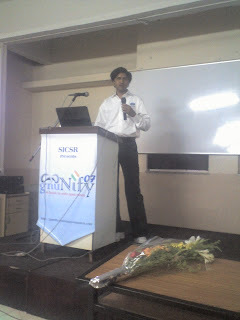 I also managed to catch up some interesting sessions like “RIA with Lazlo” by Vijay Khambalkar and Debugging apps with GNU Debugger” by Prakash Varandani and some glimpses of jam packed session of Network Security by Atul Kahate. The evening has a wonderful Networking Party at Symbiosis Institute of Management Sciences-SIMS poolside. Dinner was quite good with some interesting talks with Mr.Narain who had come from Chennai. I also managed to get a good number of pictures along with other volunteers. 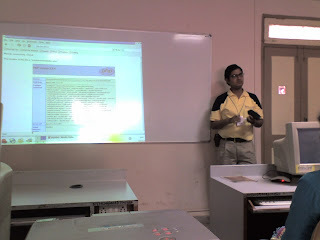 Day two started with my workshop on LAMP (Linux Apache, MySQL and PHP) along with Gaurav Pant . 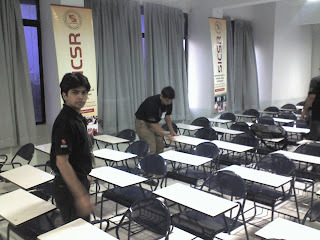 It was a 2 hour workshop which lasted for over 3 hours. The very thing that surprised me was there were more number of people who were turned down due tounavailability of space. 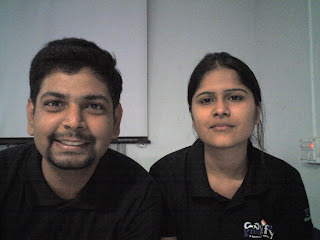 Instead of Gaurav and me taking simultaneous sessions, two separate tracks could have solved the problem. May be next year! After I finished with my workshop, I managed to get into two more sessions: “Identity Management” by Pradeep Sinha and “Backup Management” by Anand Bhalve. I really liked this product Amanda which Anand talked about. I was wondering to create a UI for that! At the end I attended Matt Barker’s session on the next version of Ubuntu called “Feisty Fawn”. 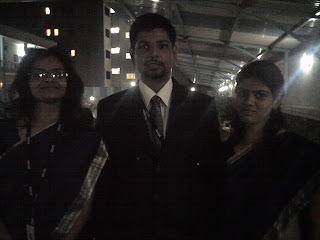 He was like a rock star with all girls going crazy about having a photograph with him! 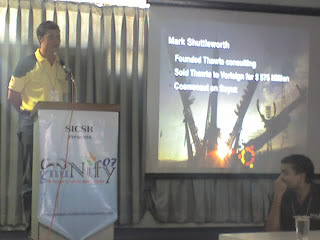 There were many sessions that I missed due to my own workshop.Session that I MISSED and REGRET were like of Tony Wasserman about “Management of Open Source Projects”, “Open Solaris” by “Moinak Ghosh”. Hopefully I will get to see them on the video recording. Day-2 ended with a photo shoot of all the volunteers. At the end, another successful event! Hope to see the same next year! 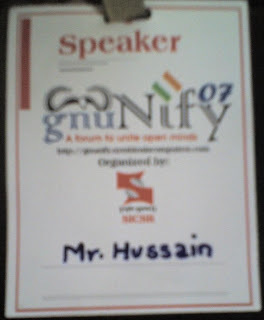 This entry was posted in conference on January 29, 2007 by Hussain Fakhruddin. 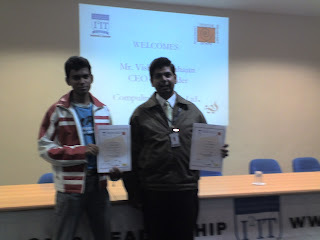 It feels really good after winning the technical quiz at I2IT. 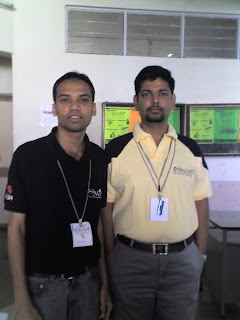 On the first thought I never wanted to participate but when my friend Manish insisted, We formed a team and went there. It was a 3 day event. The questions were from all streams of computers and weren’t easy! The best thing I liked was the last round in which a caselet was given and one had to present a solution to the given problem in about 7 mins. We were given “Air Traffic Modelling”. I remembered my friend Naved doing a case study on Air Traffic System the very instance we got the caselet! Finally there was an award ceremony where we were given certificates and a gift vouchers from crossword worth 2k(Atleast something as ROI). Overall experience was good but really really poor management. Anyway, All’s well that ends well! This entry was posted in me on January 14, 2007 by Hussain Fakhruddin.